It’s hard to think about Knoxville without conjuring an image of the Sunsphere. While some may simply see this structure as a relic of the city’s past, the reason for its existence in the first place is very much tied to what Knoxville has been and is about: innovation. Built by a local architectural firm, the Sunsphere was the theme structure for the 1982 World’s Fair, an event that was like attending the CES of that time. 11 million visitors were in Knoxville to see the numerous new products and artifacts at various countries’ pavilion spaces, but none caught more attention than this one homegrown product: a touchscreen developed by Elographics. This invention still makes several sites’ lists as one of the most significant inventions ever debuted at the World’s Fair. But what may be even more impressive is that two years after the World’s Fair, Elographics was recognized by Inc. magazine as one of country’s 500 fastest growing companies. Scalability is a prized aspect of startups now, but East Tennessee has been practicing this for years. What we also see with these scalable inventions from East Tennessee is that their disruptions in the market have durability. For instance, has a garbage truck come by your home recently to pick up trash? Thank Knoxvillian George Dempster for that invention. In 1935, his company created the Dempster-Dumpster, the first large-scale waste container that could be mechanically emptied into a garbage truck. In 1937, Knoxville became known as the first ‘Dumpster City’ by purchasing the country’s first dumpster truck and several dumpsters. As the early adopters of this invention, the city was able to cut its spending on garbage collection. And other cities soon followed. In a region that is holding its week-long celebration of innovation and entrepreneurship for the first time, the tradition itself of creating scalable, durable products has been part of Knoxville for generations. Institutions like Oak Ridge National Laboratory and the University of Tennessee have had international recognition as well as global impact. But companies such as PYA have also had its startup beginnings in Knoxville. And with newer startups like Cirrus Insights, Avrio Analytics, ReviewBox, Children’s Media Studio and Audiohand calling Knoxville home, that structure in the skyline may be the most appropriate symbol of the culture of innovation that continues to define East Tennessee. In the coming weeks, we are excited to bring you a little insight into this area as we hope you make plans to attend Innov865 Week in September. The Innov865 Alliance has partnered with Startup Southerner, who will bring you stories of innovation born in East Tennessee prior to #Innov865 Week, September 19-23. This inclusive media platform explores the dynamics of the entrepreneurial ecosystem in the South. From community-contributed posts to in-depth articles, it strives to make information about participating in the new economy accessible to everyone. Published on August 16, 2016 by Allie Rapkowicz. Jonathan Mills Patrick is a former C-level finance executive and startup founder turned strategic consultant to financial institutions, startups and tech companies. You can find him at SouthFound.com or JonathanMillsPatrick.com. This question I get probably no less than once a day from entrepreneurs. The answer is easier than most entrepreneurs seem to grasp. In the typical timeline for raising capital, you should look to your own network (second only to your own capital). This is often called the “FFF” stage (family, friends, founders). You would be surprised at the number of potential investors that are already directly or indirectly in your circle of contacts. I have witnessed entrepreneur after entrepreneur raise capital by addressing this question. Just about every community that has any level of entrepreneurial support hosts pitch competitions. Investors regularly attend pitch competitions because they are a quick way to evaluate what types of businesses are entering the marketplace and which are gaining the most traction. It also allows them to evaluate the team. These are often non-profit entities that take in a certain number of startups per year and provide them with access to limited amounts of capital, office space, mentoring, and more — in the hopes that some of the startups survive, and in fact, thrive. Investors often provide mentoring to the startups in the program. This creates a great way for investors to learn more about your startup from an in-depth perspective, as well as learn to know you on a personal level. If you are going to be raising capital you had better get used to talking to complete strangers at events and learning how to pique their interest. You had better get used to initiating conversation, getting people to talk about themselves first, and leaving a favorable opinion of yourself. Sites like AngelList facilitate the connection between startups and investors. Startups are able to create a profile and list what they are looking for in terms of capital (along with details of their company) and investors can then use that information to determine if they are interested in digging deeper. A word of caution here. Many entrepreneurs I know create profiles on a variety of these sites and then sit back and wait for the cash to roll in. They end up waiting a long time. @2016 SouthFound Media. All Rights Reserved. Published on August 09, 2016 by Allie Rapkowicz. The life of an entrepreneur rarely follows a linear path, something Bryan Crosby, Founder and Chief Executive Officer of FunLPro Technology LLC, has lived recently. As noted in this late 2015 post on teknovation.biz, the Maryville native founded the company to capitalize on a unique pouring device his father had invented. Today, FunLPro has one issued patent and two others that are pending. “We are there now,” Crosby says in describing the progress the start-up has made on several fronts. The journey has been challenging, but he sees good things ahead. It had been more than six months since we received an update on the start-up. Since then, Crosby has graduated from the University of Tennessee (UT) with his MBA and has focused all of his energies on FunLPro. The effort is paying-off. The company has a 38 mm standard pouring device that attaches to antifreeze and wiper fluid containers. It is available in a two-cap blister pack at convenience centers like Pilot, usually in the same area where bottles of the fluids are sold. This retail development is important for FunLPro. “I’m particularly focused on the retail side right now,” Crosby says, explaining that the special caps can drive cash flow while FunLPro pushes the roll out of its proprietary container and private label products. One of those private labels is Magna 1, marine oil that is now available at eight marinas on Norris Lake. Another – a white label quart of oil for KenJo Markets – should be in those stores as soon as this week. When we initially interviewed Crosby, he was focused on finding the right company in China to manufacture FunLPro’s novel funnel that is built into containers to allow safe, accurate and easy dispensing of fluids into difficult areas. The entrepreneur credits two St. Louis companies – C.L. Smith, a packaging supplier, and Hicks Oils, a producer of lubricants, for helping get FunLPro to where the company is today. Both are involved in the rollout of its private label products. “It took forever – eight months – to get a cap engineer to help us,” Crosby says, noting that C.L. Smith identified the right person. Until that happened, FunLPro spent a good deal of time testing various iterations of the cap. “Our sourcing agent vetted 58 different suppliers before we found the right one,” Crosby explained. They performed “drop, shake and leak tolerance tests” to assure themselves of the right manufacturer. The company has leased a 2,600 sq. ft. warehouse in Oak Ridge and added two individuals to the team. One is Dustin Giltname, a fellow UT MBA graduate; the other is Elan Herrera, a UT engineering student working on his dissertation. So what are Crosby’s priorities now? “I’m seeking large retail partnerships,” he answers, adding that FunLPro is also seeking capital for inventory and international patents. Thus far, the start-up has been funded through friends and family. “We want to be a licensor of our integrated caps to bottlers,” Crosby adds. What lessons would he share with other aspiring entrepreneurs? In addition, he underscores the importance of finding a native sourcing agent for any start-up exploring manufacturing in a foreign country such as China. “You need someone who speaks the language and understands the culture,” Crosby advises. Published on August 03, 2016 by Allie Rapkowicz. Paul Singh will roll into Knoxville during Innov865 Week, driving his pick-up truck and pulling a custom-built Airstream travel trailer. It’s part of what he calls the “North American Tech Tour” which features stops in both the U.S. and Canada, some for as little as a day, others for as long as a week. In the case of Knoxville, Singh is scheduled to be here for the inaugural Innov865 Week scheduled for September 19-23. Stops between Indianapolis and Knoxville include Des Moines, IA (July 17-23); Port Huron, MI (July 25-29);Syracuse, Utica and Saratoga Springs, NY (August 14-20); and Columbus, OH (September 4-10). After Knoxville, there’s one stop on the tour – Baltimore, MD (September 23-30). Published on July 27, 2016 by Allie Rapkowicz. Knoxville, Tenn.– Applications are now being accepted for the Knoxville Startup Day 2016 pitch competition. Startup Day 2016 will feature six East Tennessee startups pitching their businesses for a chance to win a $5,000 cash prize. This is the second Startup Day pitch competition. To apply for the pitch competition, eligible startups must be located in the East Tennessee region and fill out an application, available on the Innov865 Week website: http://innov865week.com/apply. Applications will be accepted through July 25, 2016. The Innov865 Alliance will review applications and select six startups to participate. Applicants will be notified of the committee’s decision no later than August 8, 2016. Startup Day 2016 is scheduled for Thursday, September 22, 2016 at the U.S. Cellular Stage at The Bijou Theater. Bryan Crosby with FunLPro Technology claimed the winning prize during Startup Day 2015 from sponsor BOBA (Business Owners Benefits Association). Investors from Alchemist Collective, River Cities Capital Funds and Chattanooga Renaissance Fund selected the winner. This year marks the fourth annual Startup Day, which is now the signature event of the newly launched Innov865 Week– a week-long series of events, September 19-23, 2016, to celebrate and showcase Knoxville as a great place for entrepreneurs to start and grow businesses. With more than 500 attendees at Startup Day 2015, event organizers saw an opportunity to leverage growing interest and momentum by expanding the one day celebration to a week long series of events for startups, entrepreneurs, investors, business leaders, students and the East Tennessee community. Innov865 Week is presented by the Innov865 Alliance. The Innov865 Alliance develops, supports and promotes the Knoxville region’s entrepreneurial ecosystem. It’s a collaborative effort to celebrate and showcase Knoxville as a great place for entrepreneurs to start and grow businesses and increase access to capital. Founding members include the University of Tennessee Research Foundation, Oak Ridge National Lab, PYA, UT’s Anderson Center for Entrepreneurship and Innovation, Launch Tennessee and Knoxville Entrepreneur Center. Published on July 08, 2016 by Allie Rapkowicz. KNOXVILLE, Tenn. – The organizers of Startup Day announced the creation of Innov865 Week at the Tennessee Venture Challenge finale today. Innov865 Week is a week-long series of events, taking place September 19-23, 2016 to celebrate and showcase Knoxville as a great place for entrepreneurs to start and grow businesses. Innov865 Week will feature Paul Singh and the North American Tech Tour, kick-off with the Kauffman Foundation’s Mayors Summit on Entrepreneurship and end with the signature event, Startup Day, Thursday, September 22, 2016. Educational panels, pitch competitions, investor roundtables and social events will be included in event programming throughout the week. Additionally, the Startup Day hosts will now be known collectively as the Innov865 Alliance. The brand represents a commitment to yearlong collaboration to develop, support and promote the region’s entrepreneurial ecosystem. Innov865 Week serves as its signature showcase, but the alliance seeks to coordinate efforts throughout the year that celebrate entrepreneurship, showcase Knoxville as a great place for entrepreneurs to start and grow businesses and increase access to capital. The Innov865 Alliance includes the University of Tennessee Research Foundation, Oak Ridge National Lab, PYA, UT’s Anderson Center for Entrepreneurship and Innovation, Launch Tennessee and Knoxville Entrepreneur Center. With more than 500 attendees at Startup Day 2015, event organizers saw an opportunity to leverage growing interest and momentum by expanding the one day celebration to a week-long series of events for startups, entrepreneurs, investors, business leaders, students and the East Tennessee community. Innov865 Week will showcase the East Tennessee startups and entrepreneurs that continue to spin out new products and processes that change the way we live– from manufacturing the first 3D printed car to fighting cancer with protons and six global cable networks that bring content to more than 100 million homes worldwide. Published on June 21, 2016 by Innov865 Week Admin. 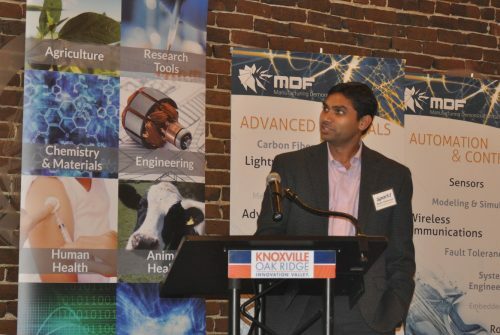 Knoxville, Tenn. Peroxygen Systems, Inc. claimed the winning prize during the 2016 Tennessee Venture Challenge (TVC) Wednesday, April 6 at The Foundry, World’s Fair Park. Ming Qi, of Peroxygen Systems, Inc. received $20,000 from the University of Tennessee Research Foundation (UTRF). The winning team was one of six pitching their business idea to a panel of investors. Shawn Butler, Austin Scott and Daniel Wiggins, of Farm Specific Technology LLC received the crowd favorite prize of $5,000, voted on by attendees through a text-in voting system, and sponsored by Launch Tennessee. Second and third place winners were Farm Specific Technology LLC and CZ Nutrition winning $3,000 and $2,000 respectively. Farm Specific Technology LLC won a total of $8,000 for its 2nd place and crowd favorite finishes. Peroxygen Systems, Inc. is changing the cumbersome hydrogen peroxide production and delivery process, making it not only energy efficient but cost effective. Hydrogen peroxide is used for its oxidizing properties, working as a bleaching agent and as a disinfectant against bacteria, viruses, spores and yeasts. Farm Specific Technology LLC won the $5,000 crowd favorite prize sponsored by Launch Tennessee. The company is patenting the Flex Roller Crimper, a flexible twist on a piece of farm equipment used to manage cover crops and get rid of pesky weeds. A panel of four investor judges scored all presentations on a variety of criteria including: explanation of product/service and the problem it solves; uniqueness of product; sizable market opportunity and ability to penetrate that market; development stage; viable business model and clear measures of success. This year’s panel of investor judges included Ken Woody, Innova Memphis; Grady Vanderhoofven, Meritus Ventures; Brian Laden, TriStar Technology Ventures; and Tim Wilson, Artiman Ventures. TVC 2016 preparation began in early February with a seven-week entrepreneurial boot camp that helped inventors define their market and refine their pitch. At the end of the seven-week series, nine potential startups competed in the TVC semifinals. During the semifinals, the field was narrowed to the six teams that competed in the final event. “Moving intellectual property from the lab into the marketplace is one of UTRF’s primary functions, and we’re excited about the enthusiasm for commercialization we’ve seen among the UT research community during this competition,” said Stacey S. Patterson, Ph.D., UTRF Vice President. QuickSod, a soilless sod product developed by University of Tennessee professor John Sorochan, Ph.D., was the winner of the inaugural TVC in 2014. The Tennessee Venture Challenge is hosted by the University of Tennessee Research Foundation as is a business plan competition for the University of Tennessee community. To be eligible for the competition, potential startup companies must be commercializing intellectual property created at a UT campus or institute. For more information, visit utrf.tennessee.edu. UTRF helps inventors at UT turn their ideas and discoveries into products and services that benefit society. In addition to supporting the university research enterprise and commercializing the resulting inventions, UTRF also supports entrepreneurship as well as state and regional economic development efforts. UTRF serves all seven of the UT campuses and institutes across the state. For more information, visit http://utrf.tennessee.edu. When conversations occur about the uniqueness of the Knoxville-Oak Ridge entrepreneurial ecosystem, they invariably quickly focus on the importance of capitalizing on the research undertaken at the University of Tennessee (UT) and Oak Ridge National Laboratory (ORNL). 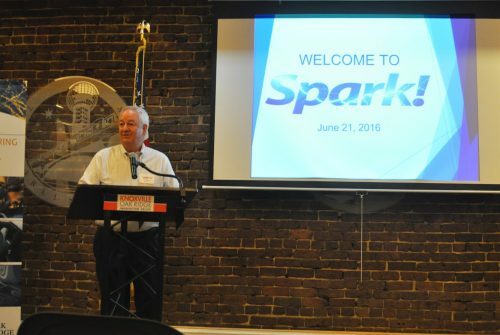 Some of those most promising technologies were on display yesterday afternoon when the sixth annual “Spark!” technology forum, co-hosted by UT and ORNL, was held for the first time ever in Downtown Knoxville. The location was symbolic in several ways. 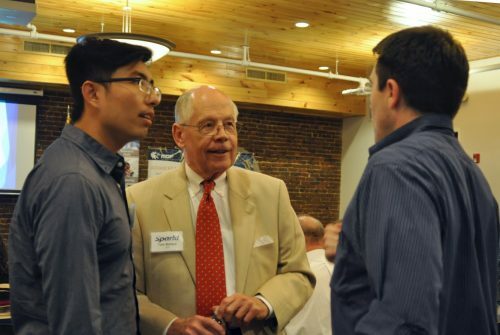 On April 19, 2016, Eric Dobson with Angel Capital Group (ACG) announced that he will be leading an effort to raise $250,000 in seed funding to support startups participating in the Knoxville Entrepreneur Center’s (KEC) accelerator program. Under this plan, accredited individuals will be able to invest in a new entity named The KEC Fund, LLC. Managed by ACG, the fund will draw on the organization’s existing infrastructure, and invest an equal amount in each of the start-ups selected for this year’s ‘The Works’ accelerator program. KEC will select the finalists with input from the new fund’s members. This is a major commitment for Dobson, who has witnessed the impact that early investments in accelerator-based start-ups can have in ensuring long-term success. Dobson’s announcement follows KEC’s call for applicants to participate in the ‘The Works,’ a merger of the organization’s ‘MediaWorks’ program and ‘CodeWorks’ accelerator. The new program will be a single multi-week accelerator with two cohorts – one composed of content creators for social media platforms like YouTube, Snapchat, and Instagram and the other comprised of software engineers developing products. Read the full story on the Teknovation.biz website.